Google Blogoscoped has published some interesting information on long rumored Google Browser, the new browser which Google started from scratch is called Chrome according to a comic received by Phillipp of Google Blogoscoped. 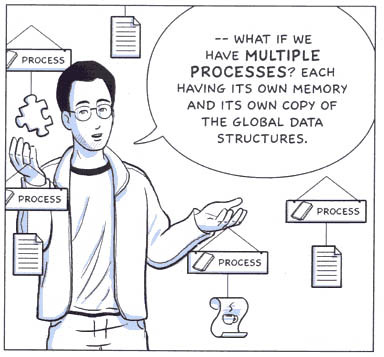 The comic book is 38 pages long, each page describes features of the expected browser and quotes from Google Engineers. These are some of the key features of Google Chrome according to the book. This is a browser built for today’s internet needs. Designed for browisng Applications not just web pages. It will have multi-threading capabilities, so separate processes render separate tabs. The browser crashes will handled well, suppose one tab crashes it will go down but won’t take whole browser with it, losing that important one page long mail you just typed in the other tab. Better protection about the malware attacks and other types of browser attacks. You can pinpoint which sites are eating your bandwidth, eating more memory and causing CPU load. Chrome will have an address bar with auto-completion, something like Firefox awesome bar. IE8 also introduced this feature called smart address bar. Chrome is using Webkit rendering engine, popular Apps using this engine are Safari browser, iPhone, Google Android Platform and Adobe AIR. It will be released as a open source project. Gears will also be integrated in to the browser to support offline use of applications. Let’s just wait and see how this Google browser will turn out.